It’s astounding to think that a first-time cash at the World Series of Poker would be in one of the most grueling and highly-competitive tournament events on the entire schedule. Winning seven-straight heads-up matches, against many of the toughest players with the deepest bankrolls in the game would be like knocking out multiple heavyweight boxing champions or whipping a Grand Slam winner on the tennis court. Those things aren’t supposed to happen. But it did, at least for one time here at the 2016 World Series of Poker. In fact, coming into this tournament, which was only the second heads-up event Percal had ever entered, he’d suffered a disastrous run over the last year and a half in series events. Percal achieved his stunning victory by winning seven consecutive heads-up matches, following drawing a first round bye. 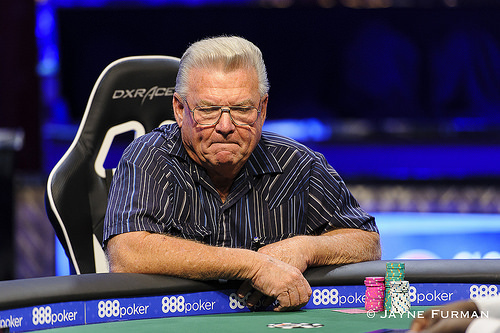 The final moment of triumph came when the young poker player scooped the final pot of the tournament ending up with a pair of eights against John Smith, a 69-year-old former Vietnam War veteran from Lahabra Heights, CA who finished as the runner up. Percal defeated a succession of tough opponents, starting with Brian Rast, Jeff Gross, Alan Wehbi, Konstantin Ramazanov, and Benjamin Geisman on the first two days, which finally ended on the third day with a victory over Olivier Busquet in the semifinals and finally, John Smith. As for his future plans, Percal joked with his boss at Humana that if he won this tournament he might not go back to work. Then again, the analyst with a deep background in statistics knows the odds of making it full time as a poker pro. This tourney which has been a staple at the WSOP over the past ten years, attracted 153 entries, which created a prize pool totaling $1,188,200. The top 16 finishers collected prize money. Second Place: John Smith, from La Hambra Heights, CA surprised the competition by coming in second. The military veteran who has been playing poker for 50 years, collected $198,192 in prize money. Much like the winner, Smith wasn’t expected to go deep, but ended up advancing in 6 of 7 rounds with what was described as an “unorthodox” style. Prior to this impressive showing, Smith had cashed in only one other event, which just so happened to be the $10,000 Heads-Up championship two years ago, when he made it to fifth round. Semi-Finalist: Alex Luneau, from Paris hoped to become the first French gold bracelet winner of this year’s series. But ended up falling just short of the finals, losing to John Smith. Nevertheless, he still ended up with a $123,929 payout. 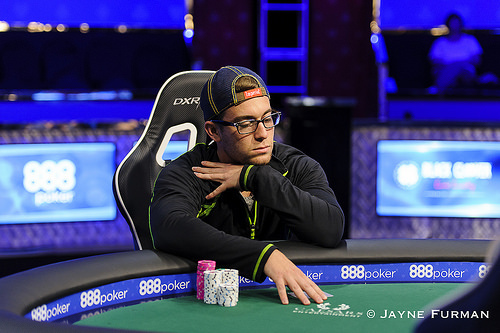 This marked Luneau’s sixth time to cash and third deep run, following two previous final table appearances at the WSOP. Semi-Finalist: Olivier Busquet, from Katonah, NY was looked upon as a favorite to win this event, particularly as the tournament played down to a smaller number. The short-handed and heads-up specialist who crafted his skills by playing high-stakes heads-up matches made one of his deepest runs ever at the WSOP, ending up as a semi-finalist, which paid out $123,929. Busquet lost to the eventual winner, Alan Percal. Quarter-Finalist: Matthew Diehl, from Flemington, NJ cashed for just the second time in a WSOP event with his deep run in this tourney. He collected $56,202. Quarter-Finalist: Nick Yunis, a poker pro from Chile, had previously posted 11 cashes, but no final table appearances. His achievement in this tournament marked his biggest cash since a 126th-place showing in the 2014 WSOP Main Event. Yunis added $56,202 to his poker bankroll. Quarter-Finalist: Benjamin Geisman, from San Diego, CA made his first WSOP cash really count with a nice run in this tournament. He pocketed $56,202 for winning his first five matches. Quarter-Finalist: Orlando Romero, from Amarillo, TX cashed for the second time at this year’s series and eighth occasion overall with his run into late on the second day of this tournament. He added $56,202 in winnings to go along with $134,000 in WSOP Circuit earnings, to date. John Smith limps the button, and Alan Percal checks his option in the big blind. The turn is the , which is a bad card for Smith. It pairs the board to erase three of his potential outs, and he's now drawing dead to the two remaining fours in the deck for his tournament life. The river is the , and Percal wins the pot -- and the Heads-Up Championship -- with nines up. 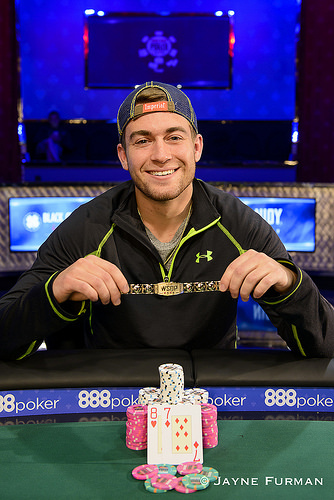 His efforts over the past three days earn him $320,574 and his first bracelet. 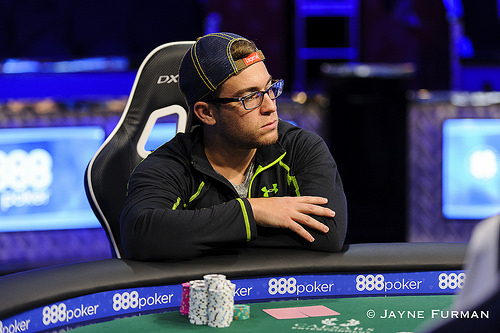 Smith is eliminated as the runner-up, earning $198,192. A full recap will be posted later this evening. Alan Percal limps the button, and John Smith checks his option in the big blind. The flop is . Smith checks, Percal bets, and Smith folds. Hand #37: Alan Percal Closing In? The flop is . Percal checks, Smith bets 300,000, and Percal calls. The turn is the , and both players check. The river is the , and it checks through once again. Percal shows , winning the pot with a pair of queens. He's opened up a lead of more than 10:1 in this duel. Alan Percal opens the button to 250,000, and John Smith defends his big blind. The flop is . Smith leads for 300,000, and Percal calls. The turn is the , and both players check. The river is the . Smith checks again, and Percal bets 400,000. Smith folds. John Smith opens the button to 250,000, and Alan Percal defends his big blind. The flop is . Percal checks, Smith continues for 325,000, and Percal folds. Alan Percal opens the button to 250,000, and John Smith folds. The flop is . Both players check, and the turn is the . Percal checks again, Smith bets 200,000, and Percal folds. Alan Percal limps the button, John Smith raises to 400,000, and Percal folds. The flop is . Percal checks, Smith bets, and Percal folds. The flop is . Smith checks, Percal bets 100,000, and Smith calls. The turn is the . Smith leads for 300,000, and Percal folds. 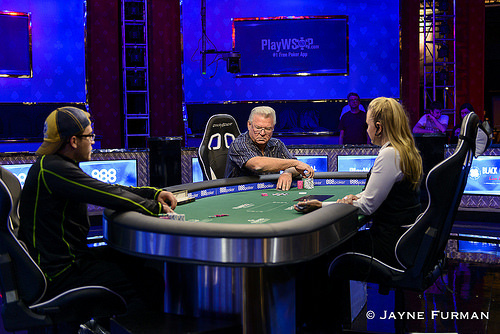 John Smith opens the button to 225,000, and Alan Percal defends his big blind. The flop is . Percal checks, Smith bets 225,000, and Percal calls. Both players check through the turn , and the river is the . Percal leads for 500,000, and Smith folds. The flop is . Smith leads for 225,000, and Percal folds. The flop is . Percal checks, Smith bets 225,000, and Percal folds. Alan Percal opens the button to 200,000, and John Smith defends his big blind. The flop is . Smith checks, Percal continues for 210,000, and Smith folds. 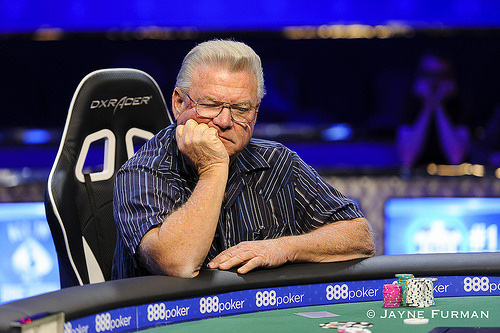 John Smith opens the button to 200,000, and Alan Percal defends his big blind. The flop is . Percal checks, Smith continues for 325,000, and Percal check-raises to 850,000. Smith calls. The turn is the , and Percal checks again. Smith bets 850,000, and Percal check-raises all in for 2,795,000 effective. Smith folds. The flop is . Smith checks, Percal continues for 180,000, and Smith folds. The flop is . Percal checks, Smith bets 200,000, and Percal folds.